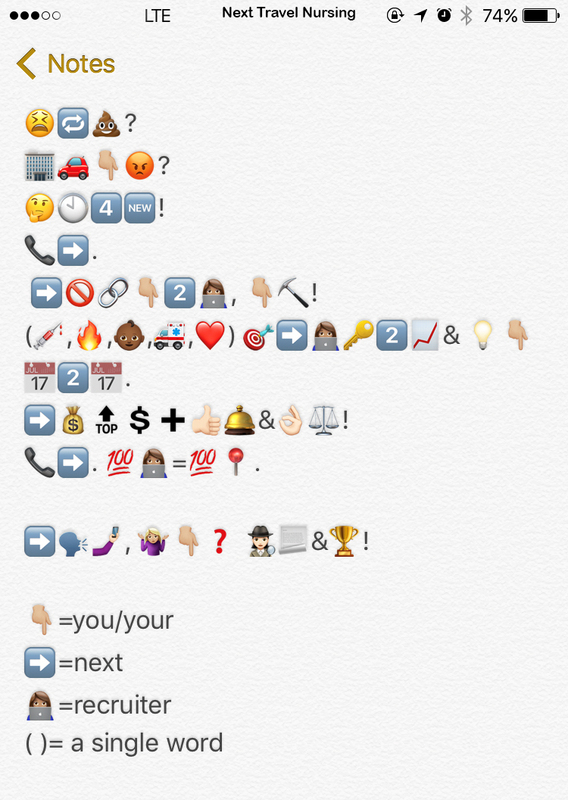 Next Travel Nursing’s Emoji Contest Winner: Corrie! When Next Travel Nursing launched its new brand, we invited nurses from all over to decode a special emoji message and win an iPad. Hundreds of nurses attempted to crack the code, but one nurse nearly nailed the code word-for-word. Upset at doing the same crappy thing over and over? Maybe it’s time for a change! Next won’t link you to your recruiter, you pick! Your Next recruiter has the keys to your success and can find your assignment! Next is highest in wages, job satisfaction and customer/employee service! Next is waiting for your call, what are you waiting for? Find an assignment and start winning! Congratulations Corrie! And thanks to everyone who played this round! Be sure to like and follow Next Travel Nursing’s Facebook page for more awesome contests like this. And if you’re interested in joining Next, now a Top-10 travel nursing company, click here.